Each one is quite aware that most saplings planted during the Van Mohotsava are just photo sessions and no one bothers to look at them again. There are exceptions to the same as well like Green Saviour’s and others. With the summer heat on the rise, a worried group of morning walkers in Vaccine depot have taken the noble job of watering the saplings planted in the Vaccine Depot. Due to the heat generally, the saplings dry as there very less moisture in the soil. 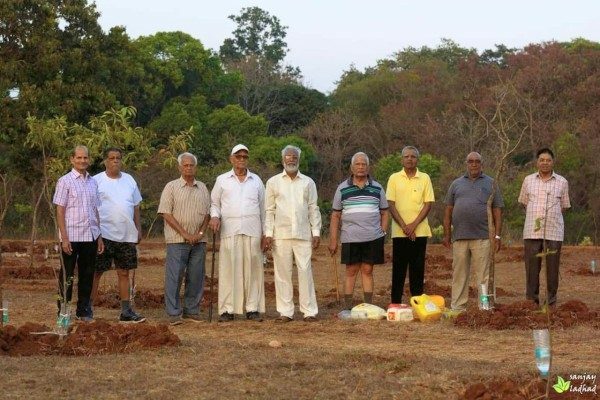 This group of senior citizens are leading the way by watering the saplings in the area for over a month now. There are several block plantations in the depot and the survival of many of these saplings is difficult during summer. Vijay Jamble, V G Chougule, R B Patil, M N A Bhat, Bandu Paramshetty, Uday Shidore, Yallappa Parlekar, Prabhakar Kodkini, A K Kulkarni and Acharya Gangur decided that they should start watering the saplings. They decided to water the saplings on a regular basis until summer ends. Empty plastic bottles were collected and a hole was made in the cap while the bottom was sliced off. A water tap in the vicinity is the source of water, from where water is filled in 5 liter containers and each bottle is filled with water. With the small hole drops of water keep flowing at the roots of the saplings giving them enough moisture to survive this heat. Your selfless service will go a long leave. Cheers to AllaboutBelgaum team in highlighting such acts and holding hands in such endeavours.. They are showing the way. Senior Citizens are Wisdom Banks.